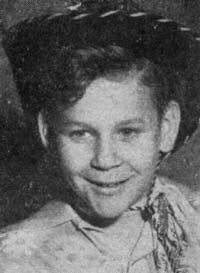 Frank Evans was a 13-year old veteran and hillbilly music star in the Tampa, Florida area in the early 1950s. By 1953 or so, he had already done 78 consecutive weeks of shows on two Tampa radio stations - WHBO and WALT. He had his own show and it was sponsored by the Velda Ice Cream Company. As television came into the light of day, Frank also worked television appearances into his busy schedule. In 1956, Frank and his group were being seen and heard over WSUN-TV in St. Petersburg, Florida. One of the highlights they said of his early career was appearing on the same bill with the legendary Red Foley when his show came to Tampa. Cowboy Songs No.44; June 1956, American Folk Publications, Inc.; Derby, CT.